The thermal behaviour of swine sludge/olive by-product blends was studied during pyrolysis and combustion processes and the compatibility of each component in the blend was evaluated. The experiments were conducted in a thermogravimetric analysis system, up to 900 °C. 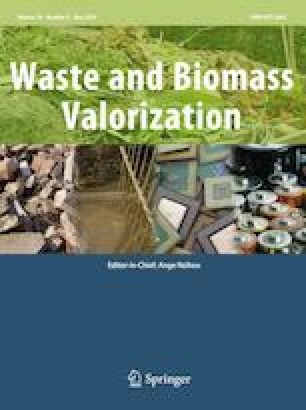 A modified independent parallel reactions model and a power law model were developed for pyrolysis and combustion, respectively and their validity was assessed against experimental data. The effect of inorganic constituents of the fuels on slagging and fouling propensities and environmental pollution was examined, through mineralogical, physico-chemical and fusibility analyses. The swine sludge decomposed over a broader temperature range than the woody residues and its combustibility was lower. Olive kernel and swine sludge showed an additive behaviour upon blending, for both pyrolysis and combustion processes. Olive pruning and swine sludge mixtures presented additivity during pyrolysis, while synergy during combustion. The kinetic models fitted the experimental results with great accuracy. The slagging/fouling potential of swine sludge was significant, while toxic metals in ashes were below legislative limits. The authors kindly thank the laboratories of Applied Mineralogy for the XRD and fusibility analyses and the laboratories of Hydrogeochemical Engineering and Soil Remediation and Inorganic and Organic Geochemistry for the chemical analysis of the ashes.